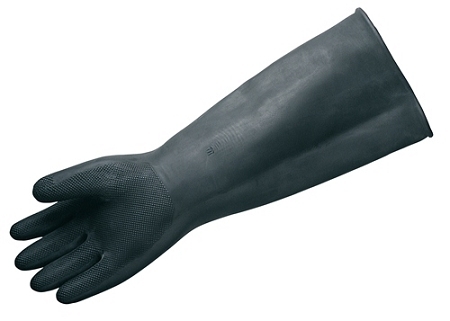 Black natural rubber pot sink gloves. One pair. Extra long 24" length. 40 mil, unlined, embossed grip on palm and fingers, roll cuff. Chemical resistant, liquid proof. Men's size Large. Made in Taiwan. Q: Good afternoon I need this glove to re-sale. Do you another price? A: All pricing is based on quantity purchased. An end user who buys 1 dozen pairs of this glove gets the same price as someone who intends to buy for resale.